Hello and welcome my beautiful friends! This is a very exciting week and a very exhilirating post for me! Starting from this week, I will be featuring my " Weekly Favorites" on the blog with you guys. I'm so thrilled about that, because there are way too many topics I want to discuss with you and sometimes not enough time. Hence, I decided to make the time. I've toyed with this idea for some time, yet since this is a bit of a commitment, I've kept pushing it aside. Quite frankly I'm not so good at commitment. Haha... Hey, at least I'm honest about that. I'm always up for a challenge though, so this will definitely be a good one. These favorites will be personal, maybe small in comparison to the monthly favorites, yet in some way much deeper and more insightful. I remember the first time I saw this quote was on someone's Instagram account. I instantly took a screen shot, as I wanted to make sure I remember this one. You see, regardless of what you choose to do in this life, people will make commentary remarks about your choices and actions- Good or Bad. 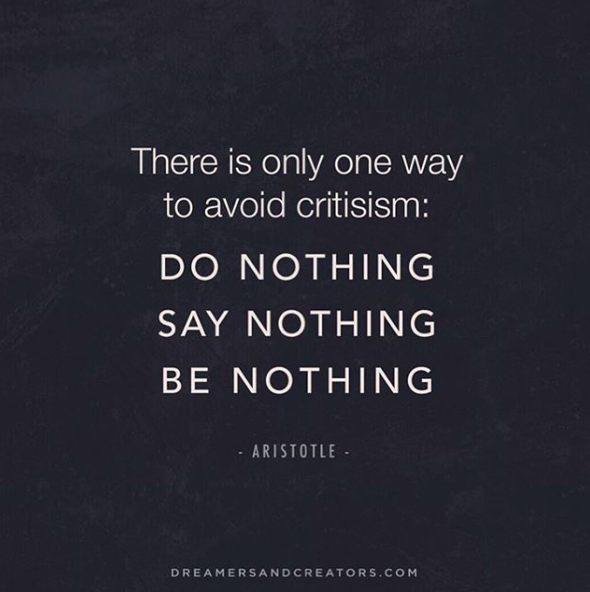 It's inevitable, well unless you choose to say nothing, do nothing and be nothing...and believe me, even then someone will find a reason to criticize you. Haha! If you want to do or create anything great in this life, you'll have to make peace with the fact that you might upset or piss some people off. In fact, any great work usually stirs a great deal of emotions and drama and that's a good thing. It's all part of the package of living an authentic life. Other people's criticism comes from their own fear and insecurities. It has nothing to do with you and everything to do with them. I have been listening to this song non stop for the past week, and surprisingly I'm not yet sick of it, haha! That's always a good sign. I love the beat and the lyrics. It reminds me of my excitment for traveling the world, memories from favorite cities I've been to and desire to discover it all. Let me know what you guys think of it after you listen to it. I recommend listening to the actual podcast for more details. He talks a lot about the Five Minute Journal on this episode and gives really great tips on how to use it even better to create a happier and more mindful life. The ones of you that know that I do not wear leather, know about my struggle of finding non leather shoes that I like and that are "somewhat" good quality. The winter is especially a difficult time for me, as most non leather boots look cheap and tacky, for the lack of other words. So, you can imagine my joy when I happen to stumble upon something that looks decent and is actually comfortable. These Topshop booties have a 70's vibe to them with a gold accessory on the side and a chunky heel that is perfect for everyday walking and running errands. I liked them so much I bought them in both black and light brown color. I've been loving almond milk by Rude Health. I've been drinking almond milk pretty much every single day for the last month. I use it when I make my Green Tea Matcha latte, with paleo breakfast cereal we have on some mornings, when I drink my protein shake or when we make the golden milk drink with Alex. The brand I love is Rude Health. There are only two ingredients on the box - Water and organic almonds. So, when I'm lazy to make almond milk at home, which is pretty much all the time. Hey, I have an excuse, we don't have a good blender, haha! I opt for the Rude Health Almond Milk, because it's the cleanest almond milk I've been able to find on the market. And that's all for this week. What are some of your favorites this week? Do share please.